Each subwoofer manufactured is part of a series. This is the name of the subwoofer's series. Refers to the diameter of the subwoofer, measured in inches. Peak power handling refers to the amount of power a speaker can handle during a brief musical burst. The RMS power range figure is a much more reliable rating for determining the speaker's power requirements. The Peak power handling specification is typically rated per speaker unless otherwise noted. 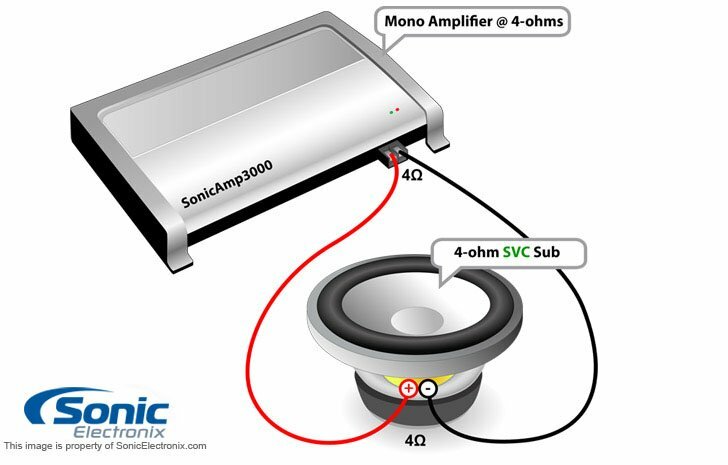 The RMS power is the amount of power the speaker requires to operate safely and properly. 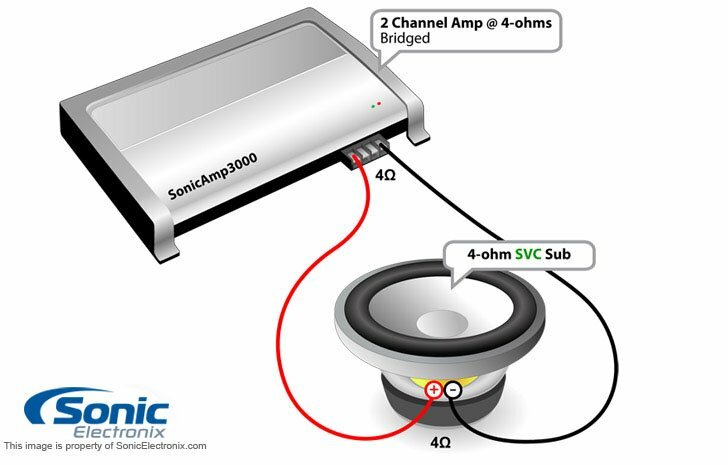 RMS Power Handling refers to the amount of power a speaker can handle on a continuous basis. We recommend powering your speakers or subwoofer with 80%-120% of its recommended RMS rating. 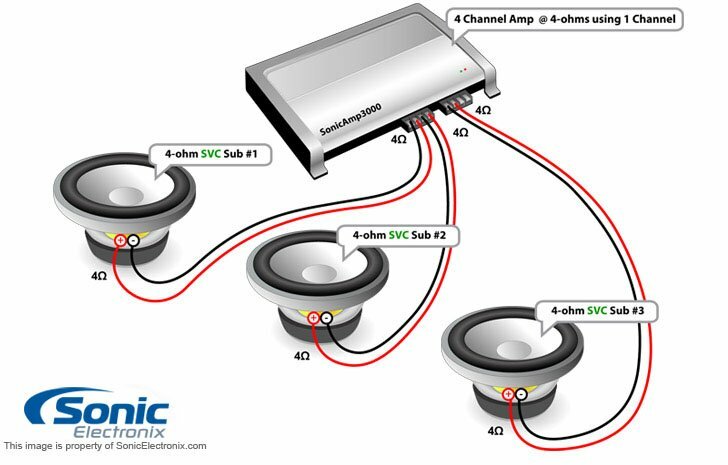 The RMS power handling specification is typically rated per speaker unless otherwise noted. 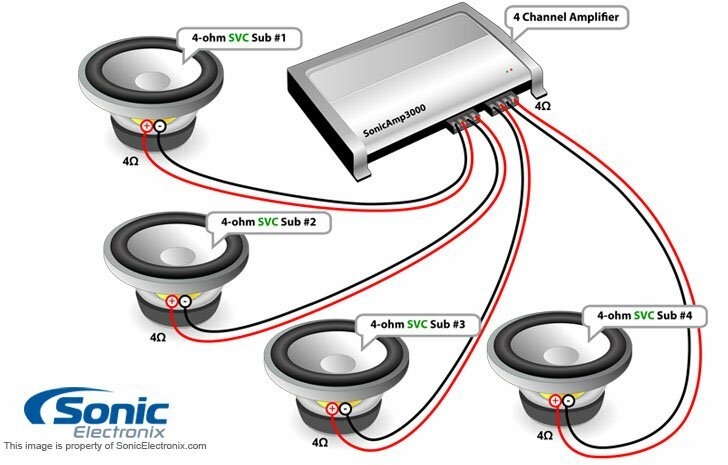 Dual voice coil subs have more wiring flexibility than single voice coils subs; however, single voice coil subwoofers provide easier hookup options for wiring multiple subwoofers in parallel or series. 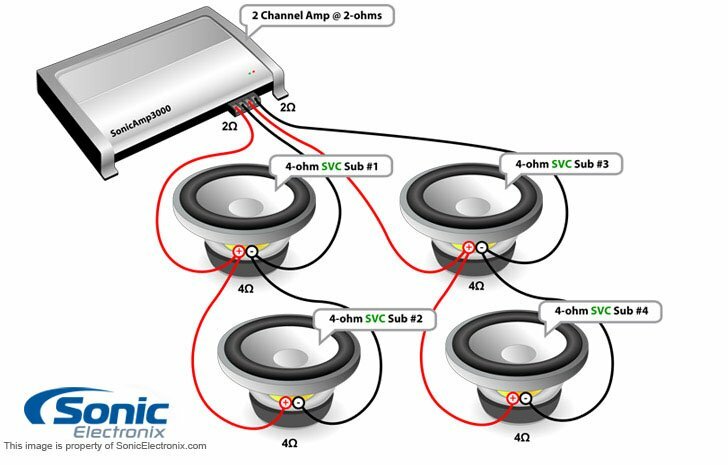 You may also run a dual voice coil (DVC) sub in parallel, series, or combination. A quad voice coil has four voice coils and is equal to two dual voice coil subwoofers as far as wiring goes. The load value (in ohms) that the speakers present to the amplifier per voice coil - the amount of resistance to the current flow. 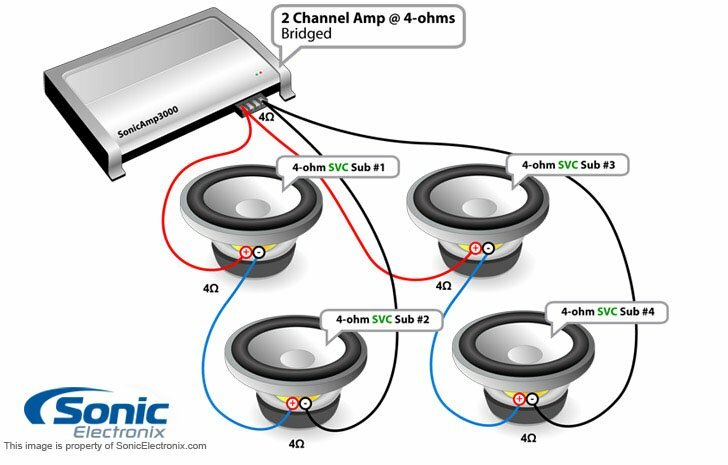 This is a key specification as subs wired in parallel or low impedances can create problems with your amplifier and potentially void all warranties. We encourage you to ask our support department prior to purchase if you do not understand which impedance level will suit your application best. Diameter of voice coil, usually measured in inches. The range of frequencies the speaker will reproduce (lowest frequency to the highest). Bigger is better, meaning the wider the range, the better. The optimal range is 20 - 20,000 Hz (which is the range of human hearing). An efficiency or sensitivity rating tells you how effectively a speaker converts power into sound. 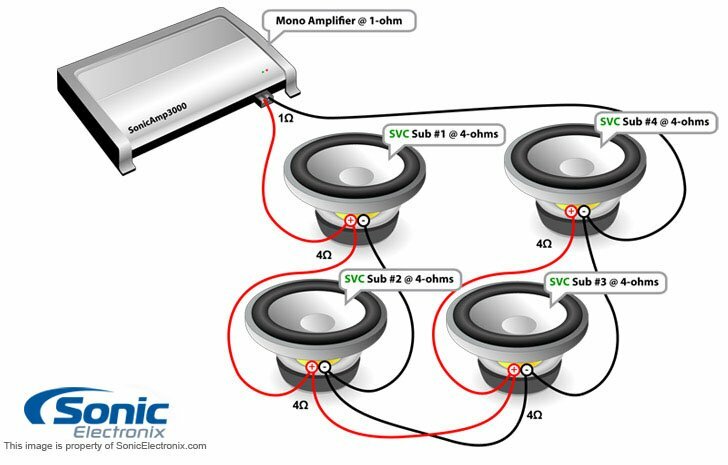 The higher the number, the more efficient the speaker and the louder it will play with the same input power. An efficient speaker helps you maximize your available power. 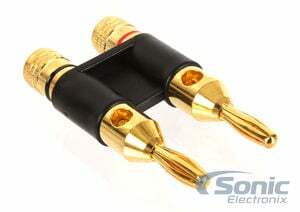 Most sensitivity ratings measure the speaker's output with 1 watt of input, 1 meter from the speaker. 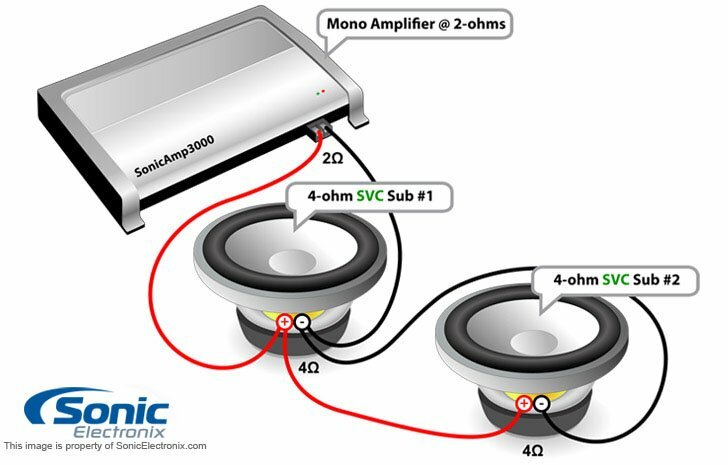 Some speakers' sensitivity is measured with 2.83 volts of input, instead of 1 watt. 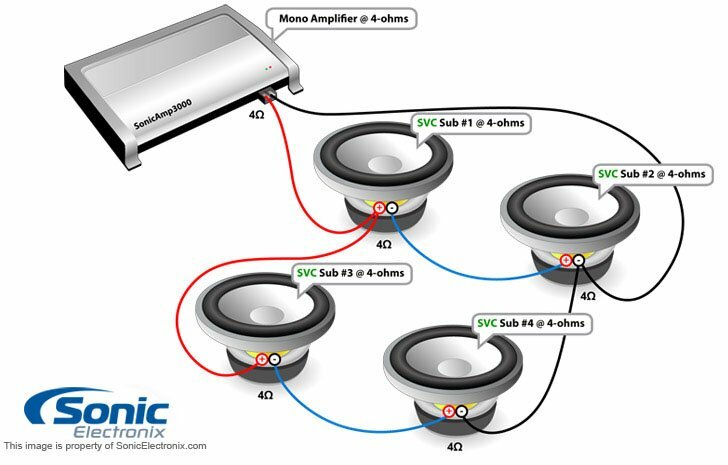 Efficiency (1w/1m) is not an accurate indicator of a subwoofer's output capability and should not be used as a comparison to other speakers or subwoofers to determine which one is "louder". Typically measured in millimeters, the Xmax value is the measure of a speaker cone's maximum excursion in one direction while maintaining a linear behavior. This is the design of the subwoofer or the opening of the subwoofer enclosure. Each design has it's own benefits, whether it is a square, circle, or oval. 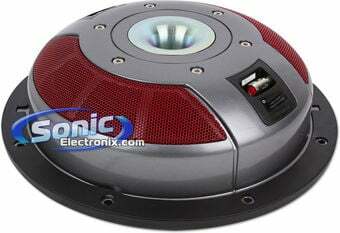 Round/Circle: This is the typical and common subwoofer design. They have a round cone and are a circle in design. Square: These woofers are able to achieve a greater cone area in a smaller space. Because of the greater surface area, some square subwoofers will be louder than a round subwoofer of the same size. This is the color of the speaker's or subwoofer's cone. Lightweight woofer cone materials are essential for efficient operation. 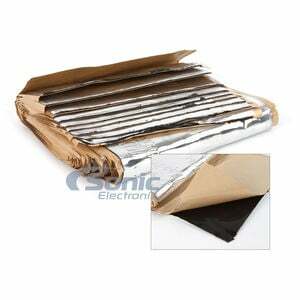 Poly cones produce exceptional sound and are sturdy against various changes in temperature. Paper cones are very efficient, and when treated for moisture resistance, will perform at a high level. Poly refers to polypropylene, which is thermoplastic or fibers that are polymers of propylene. IMPP refers to injection molded polypropylene, a commonly used process and material in speakers. A speakers surround is part of the suspension system. The surround protects the cone and prevents it from being displaced as it flexes out from the basket. It is usually made of a durable material like treated foam or rubber in order to withstand the strenuous job of producing bass frequencies. Defines the overall structure of the subwoofers magnet. 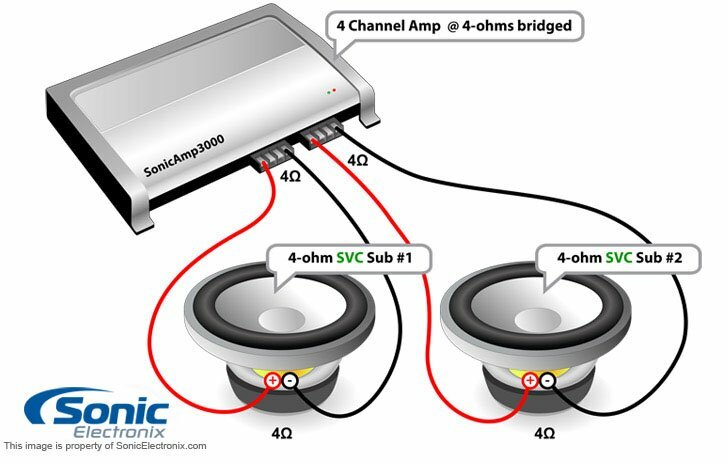 Most subwoofers are able to accommodate a universal grille; however, some subs include a grille and others have a specific, optional grille available for purchase separately. If "yes", then the subwoofer includes a grille. 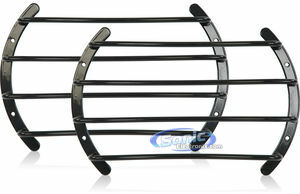 If "optional (sold separately)" the matching grille will need to be purchased in addition to the sub. Some higher end subwoofers have replaceable cone assemblies. In case of a blown woofer, a recone kit allows for a simple replacement, as opposed to purchasing an entire new subwoofer. This is the recommended type of enclosure that the subwoofer should be installed into. Some subwoofers are specially designed for particular enclosures. Sealed: These enclosures completely enclose the air inside the box. These boxes produce a tight bass. Ported/Vented: These enclosures have a slot of air to escape from the box. The result is a sound that has more "boom". Bandpass: These are a combination of both sealed and ported enclosures. They can be very efficient, but require tuning for the best response. This value indicates the minimum sealed box volume that the manufacturer recommends for the subwoofer. The volume is typically displayed in cubic feet. This value indicates the ideal sealed box volume that the manufacturer recommends for the subwoofer. The volume is typically displayed in cubic feet. This value indicates the maximum sealed box volume that the manufacturer recommends for the subwoofer. The volume is typically displayed in cubic feet. This value indicates the minimum ported box volume that the manufacturer recommends for the subwoofer. The volume is typically displayed in cubic feet. 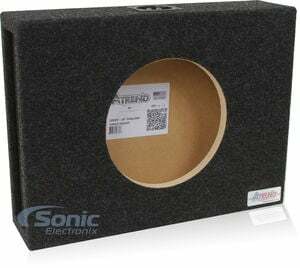 This value indicates the ideal ported box volume that the manufacturer recommends for the subwoofer. The volume is typically displayed in cubic feet. This value indicates the maximum ported box volume that the manufacturer recommends for the subwoofer. The volume is typically displayed in cubic feet. The depth when installed on top of the mounting surface. 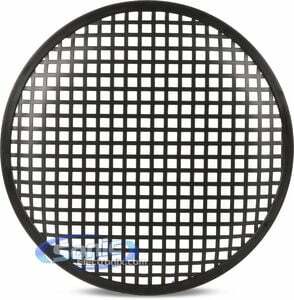 Measured from the bottom of the speaker's magnet to the bottom of the mounting holes on the rim of the speaker. The actual diameter of the hole you will need to cut out if you are creating a new mounting location for this speaker, or if you are mounting a subwoofer in a box. This means that the subwoofer/speaker is designed to be installed in areas that do not have a lot of space. 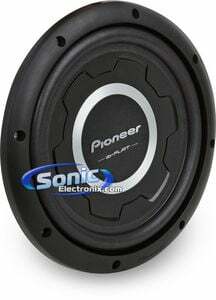 Shallow mount subwoofers are typically found under a seat or behind the seat in some trucks. 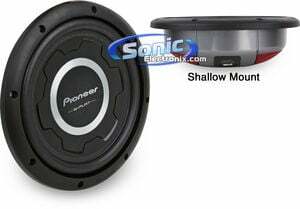 Shallow mount speakers will typically have a mounting depth of 2" or less, while shallow mount subwoofers will typically have a mounting depth of 3" or less. The free-air resonance frequency of the subwoofer, measured in Hz. At this frequency the weight of the moving parts is perfectly balanced with the subwoofers suspension system. This is the amount of air that has the same stiffness as the subwoofers suspension. The greater the rating, the lower the stiffness and larger recommended enclosure. It is measured in Liters. This is the subwoofers relative damping (Q) at the resonance frequency (Fs), including all dimensionless losses. 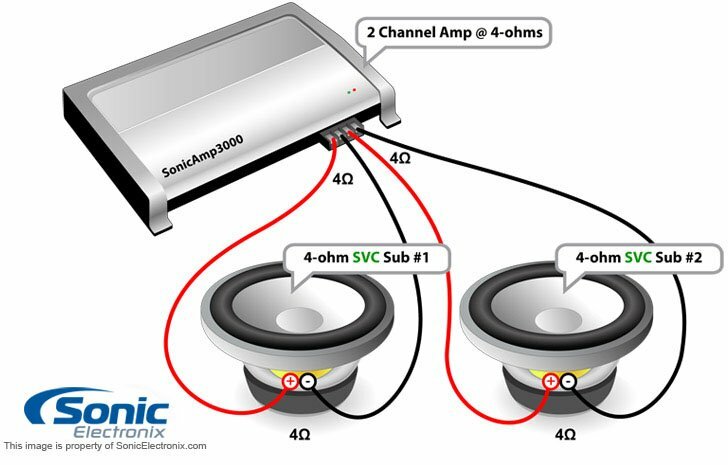 Essentially, a high Qts value (closer to 1.0) means the subwoofer is great for sealed enclosures and a low Qts value (closer to 0) means the woofer is great in vented enclosures. A Qts of around 0.45 means the woofer will work decently in either enclosure type. The subwoofers relative damping (Q) at the resonance frequency (Fs), including electrical losses. Also called the mechanical damping of the subwoofer. The unitless measurement usually varies from 0.5 – 10. Amount of DC resistance of the subwoofer when measured with an ohm meter. Typically, this will read less than the impedance rating of the subwoofer. This is the subwoofers relative damping (Q) at the resonance frequency (Fs), including mechanical losses. Also called the mechanical damping of the subwoofer. This unitless measurement usually varies from 0.5 – 10. This number represents the trade off between having an efficient woofer and one with a wide bandwidth. To calculate this number, take the Fs and divide it by the Qes. If the number is below 50, the woofer is designed for a sealed enclosure only. If it's between 50-100 it can be used in either. Lastly, if it's greater than 100 it's designed for vented enclosures. A detailed list of the equipment (main product and accessories) included with your subwoofer. If special accessories are included in the box, they will be listed and detailed below the main list of equipment. Paperwork included with the product. Standard accessories are included in the main list above; however, this line provides specific details on an additional, unique accessory that is included with the product. Standard accessories are included in the list above special accessories; however, this line provides specific details on an additional, unique accessory that is included with the product. We're an Authorized Dealer for nearly all the brands and manufacturers we sell. In the rare occasion we are not authorized, we guarantee that the product comes from an Authorized dealer or distributor. 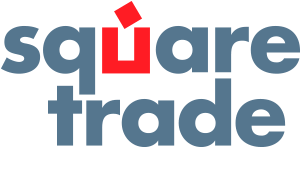 As such, we will always assist you even past the return policy to assure you the entire manufacturer warranty is covered in the event you have encounter a manufacturer defect. Promotions we have offer More Ways to Shop for items that are on clearance, last chance, special offer and sales, Made in America, and more! I installed this one underneath my 2008 F150 Supercrew and it rocks. Also thanks to Sonic for fast shipping.. I was not sure how these slim subs would perform, but I needed the slimmest subs I could find and these subs are awesome.... I have been running them in a 2011 Tundra crewmax and they hit hard and I have two 10's and they are being pushed by only 350 watts and that is plenty. I was very pleased the sound is tight and clear. requires correct sized enclosure, preforms beautifully. I have used two of these sub woofers in various boxes and I must say you can't differ much from the recommended enclosure size. Even the minimum/maximum are too small/big respectively. be careful which subwoofer you select from this line, the 2ohm woofers have a higher xmax and different characteristics. Packs a good punch for a little guy! This sub is perfect if u have limited space to work with. Sonic you guys are awesome! Thinking about getting two 8's for my Honda coupe real soon! Installed one sub about a month ago in custom box for super cab F-150. box is slightly larger than minimum required by pioneer and filled with polyester pillow stuffing. In a word- wow! amazing bass from from single 10", I actually had to turn the gain back to half on my Alpine MRP-500 amp (also a great product) because the bass was overwelming. 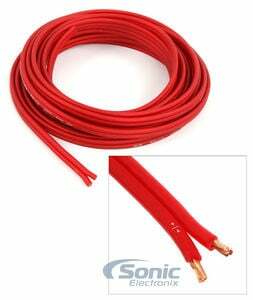 Well satisfied, would buy again from Sonic Electronix, best price around and excellent service! Just got the sub in today, put it into the stock pioneer sub encloser that gm gave the delta platforms in the trunk. Had to modify the encloser a bit to make it fit but looks good in the stock box. sounds great and has a good sound. If anyone is planning on doing this mod to their cobalt, g5 or ion i highly recommend this sub. I paired it with a rockford fosgate p-400 atm and it hits hard enough for the time being. probably upgrade to a mono block 600 watt soon. Keep that bass down low!!!!!! I have very limited space behind the rear seat in my Tacoma Double Cab (1st generation). I found a box to fit that is 0.33 cubic feet. That is just a bit below the minimum recommended volume for the Pioneer. It was the only option for a 10" in that volume box (sealed). It can put out a lot of bass. Not as much as a no compromise sub, but an amazing amount for 0.33 cubic feet. It sounds OK as is, but really comes to life when you add some boost to the lower octaves. I use a Fosgate 400-2 amplifier with the PEQ (0-18dB bass boost at 45Hz). It seems to have plenty of excursion (Xmax) to handle the bass boost. This sub lets me have decent bass and keep all my seating. Subwoofers slim profile fit nicely under my seat. Clean, clear, hard hitting sound. Fast transaction. This sub is a nice option when space is an issue. It has a nice tight sound but lacks a little when you want low deep bass to continue to ring out. It has plenty of bass to round out a set up though and definitely worth it if you're system is lacking on the low end. To do it justice you're going to need a decent amp. It needs a true 300 watts RMS to really take advantage of it. these speakers are excellent i bought two of them for a gmc canyon crew cab and there is nothing i can complain about. they sound great and for the price are unmatched. i have them on a 2600 watt power acoustik amp in a sealed box. the box could use some improvement for this truck but definitely a great buy. I bought these because I was really tight on space in my 1999 Dodge RAM quad cab. They fit nice under the seat. Give a crisp clean sound. Won't handle real low bass but for mostly sound quality and listening on a regular basis, they are definitely worth the money. Its a great product made from quality materials. It has a very low clearance on the mounting depth, yet is still powerful even in a small box. Bass is tight and clean. It peaks at slightly higher hertz than a normal ten and has trouble with anything particularly low, which is to be expected. Based on the fact that they're a 10" shallow mount I couldn't ask for much more. Especially considering that my box volume is a little shy of the minimum volume and they're up against the bottom of a seat. I'd love more output, but I didn't get to be greedy with the limitations I put on the installation location. This subwoofer is perfect for small spaces I have it in a custom sealed box behind the back row seat in my 04 dodge Dakota crew cab. It sounds great! Its not like the alpine type r that u hear three blocks away but it is super clean and efficient and is loud inside the truck. It's perfect for limited spaces. The power is more than I was expecting and looks fantastic. I didn't give up any space right under the trunk of my 2010 VW GTI and sounds great. I'm thinking on buying a second one. Keep your subwoofer safe from accidental damages with this amazing grill. Keep your subwoofer looking amazing while keeping it safe. Ultra-flexible PVC blended jacket for easy installation. 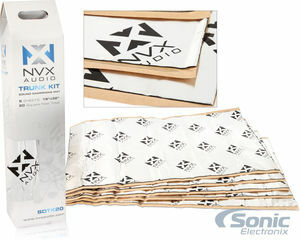 NVX Sound dampening is thicker than competitors, eliminates rattles and gives you bigger bass! Stinger's Roadkill sound dampening series is sure to kill unwanted road noise and rattles! Enough sound dampening for your whole trunk! Universal rubber roller to make it easy to install sound dampening. Spray adhesive used for adhering carpet to subwoofer boxes without bubbles. 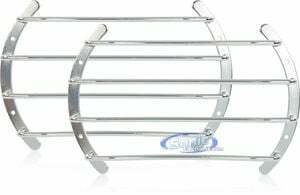 Enables an expandable, secure connection accepting up to 8 gauge wire. 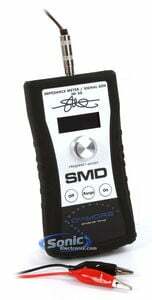 Monitor the noise level of your new car audio system with this SPL meter measuring from 60-135 dB. 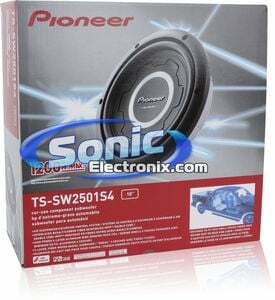 Car Subwoofer Size Buying Guide | What Size of Sub Should I Get? 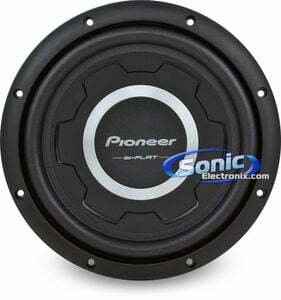 View all available accessories for the Pioneer TS-SW2501S4.